IE6 has long been a thorn in the sides of many web developers, offering limited support for many established web standards that often force devs to implement ugly, ugly hacks. It might not be so bad if there weren’t so many people still using the damn thing over eight years after its release (and two full browser upgrades from Microsoft), but it still has an alarmingly large following. Its poor performance, combined with its persistance, has made it one of the worst tech products of all time. And Digg has had enough. In a new blog post User Experience Architect Mark Trammell writes that the site is strongly considering removing some of the site’s core features, like digging and commenting, for IE6 users. This isn’t necessarily to punish those users, but rather to cut back on largely wasted development time. Trammell explains that while IE6 users make up around 5% of site traffic, it only accounts for 1% of diggs, buries, and comments. Digg developers are being forced to spend a very disproportionate amount of time to keep those features working in the ancient browser, and they’re thinking of simply abandoning those efforts. The site would still work for pure browsing, but IE6 users wouldn’t be able to interact with the site. 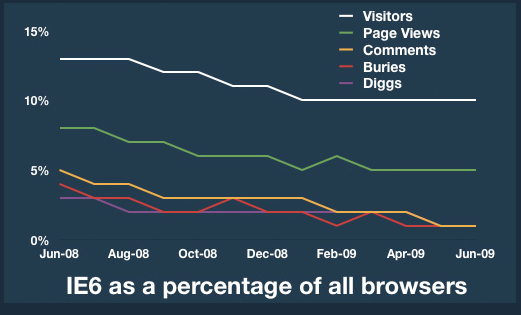 Trammell’s blog post also includes some good insight as to why Digg users are still browsing with IE6. Digg is no longer as tech-heavy as it was in its early days, but it’s safe to say that most of the site’s viewers are at least aware of IE7 and IE8 (not to mention alternatives like Firefox and Chrome). So rather than simply put out banners prompting users to upgrade to a new browser (something that Twitter just started doing), it decided to run a poll. The results? 77% of the Digg users on IE6 simply don’t have a choice, citing reasons like “I can’t upgrade because I don’t have admin access” or “I can’t upgrade because someone at work says I can’t”. In other words, they’re probably just as unhappy about it as Digg is. 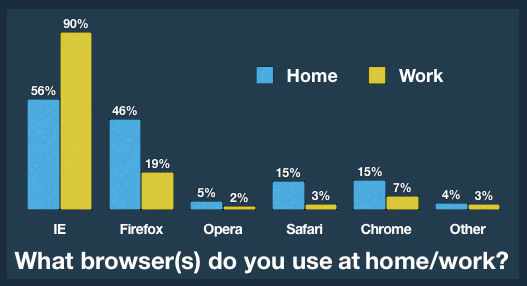 Granted, this poll is probably prone to substantial bias (people who are frustrated about their browsers probably feel more compelled to take a survey and tell people about it), but it’s still worth noting. Given the results, Digg isn’t going to be running a “Upgrade Now!” banner any time soon, but it’s still considering the feature cuts described above.